MIDI Sprout for iPhone Bundle On Sale Now! We are pleased to announce that the MIDI Sprout app is now available in the App Store. 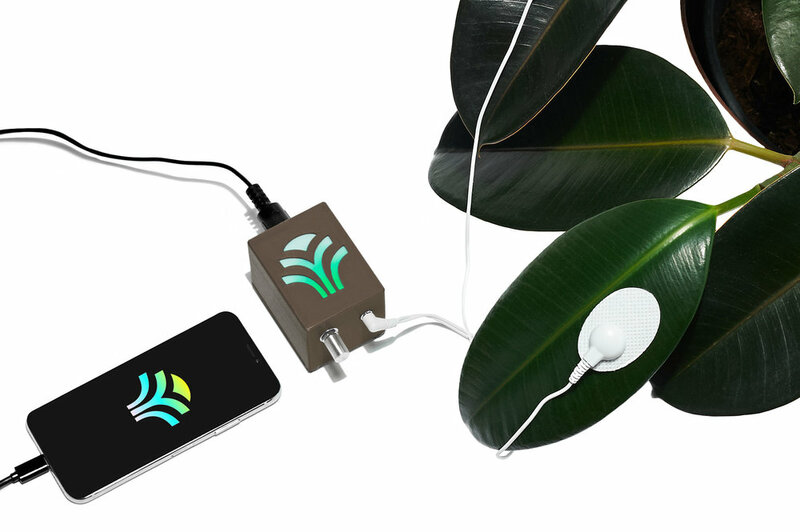 When connected to a MIDI Sprout for iPhone, our app allows you to listen to your plants play harmonious sounds designed by our team of artists. In addition, MIDI Sprout has gotten an update! Due to popular demand, we have chosen to replace the original cardboard enclosure with bioplastic to increase durability while also continuing to make use of renewable plant-based materials. The new enclosure is actually made from non-GMO corn and cork! We've re-stocked our inventory and MIDI Sprouts are now shipping. Get yours today! A sonic expedition into a world where plants and humans communicate through music – Compiled and produced by Lisbon-based DJ, Carlo Patrão. For people that are seeing Years for the first time, can you give a brief description? It’s basically a modified turntable that uses a camera as a pickup and that samples a microscopically small image of the year rings. Those are then translated into sound by programming. It’s not a very direct translation. I tried it first and, I wasn’t able to build anything that really worked that produces sound output. So I went with translating the visual image into piano tones which sounds nicer. So, you tried it by taking the data and having that make the tones rather than having it translated to a 12 tone system? I really tried sonifying with opto-sensors. It’s just not really controllable what kind of image you get. You can only go for the brightness values of a certain point. It’s just not enough data. It doesn’t relate to the year rings actually, or not that much. And then again I tried just sonifying the image but it’s really hard because it’s a pixel based image. With analog media you can just input it and just change cables and put a video signal into a stereo if you want to. But digital it’s really hard to have it make sense. I just failed at that and I decided to make a generative sound machine that is being interpreted by the year rings. 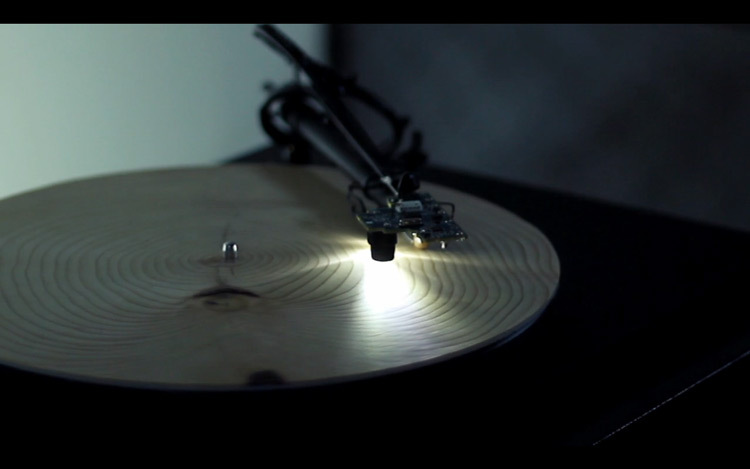 So I guess it doesn’t follow the rings, but how do you get it to play the whole piece of wood? The tone arm moves to the inside in a linear fashion. There’s a certain time that I set and it takes that amount of time to move to the center of the record. The year rings are so non-perfectly circular, that I couldn’t follow them. So whenever there’s a tree ring in the field of view of this microscopic camera, it releases an event. Not at all. This is partly why I was interested in doing this. I really enjoy working with sound. Actually, I have a very visual background. I studied graphic design, mostly. Graphic design can be so limiting in some ways because you train your vocabulary. For me, I had these different vocabularies that I was always working in. It was hard to get out of that and since I had no musical background, it was very interesting to work (with sound) because you can produce ideas that would be very different from the approaches that you usually take. You’re losing a lot of your intuitive manners that you acquired over the years. You have to find a new approach. I like to work with sound and I enjoy this a lot but I really do not have any gift for composition and stuff like that. But then again, I like to produce sounding objects. Like, with Years, I set a rule set for the compositions by programming and building this machine which has some kind of internal rules of how it works so it can’t just produce any sound but then again the composition is actually then being made by the tree’s data, which is not really random. Some people would say it is random but I think it’s not because it has a very special structure and follows certain rules that derive from other systems, like ecological systems. But there is always a rule-set to find in there. It’s interesting you mention coming from a graphic design background. Something I see inYears is that it’s a very different way of experiencing a plant through time. I almost get this feeling that it’s an audio version of a reverse timelapse. Is there a reason that you picked audio to express this idea? Is that the idea, or am I just interpreting something? No, that’s good. What you said is something actually I just stumbled over yesterday. For me, the thought of this compressed amount of time and the amount of time that’s actually needed to grow this structure and this data set is a very important interest in the medium of the physical representation of the time of the song. I didn’t specifically think about it when working on it. For me, it was interesting to compress this amount of time into this visual structure and then again make a song out of this. On regular vinyl, there is this groove that represents however long the track is. There’s a physical representation of the length of the audio track that’s imprinted on the record. The year rings are very similar because it takes a very long time to actually grow this structure because it depends on which record you put on of those I made. It’s usually 30 to 60 or 70 years in that amount of space. It was really interesting for me to have this visual representation of time and then translate it back into a song which it wouldn’t originally be. In terms of generative art and music. What are some of your influences. Do you see this work as part of a certain movement? There’s a lot of works that I admire. Maybe the one that’s closest that I really like is. Céleste Boursier-Mougenot. I think it’s kind of similar, actually. I see them all as algorythms and rules. Certain systems for making another composition. This one really impressed me when I saw it because it’s, aesthetically very beautiful and in a way it can initiate some certain thought’s but it’s not too concrete and it’s far from esoteric. You can say, this is the song that the bird sings or plays or whatever but it’s certainly with the result of all of these influences and all of this environment and also the way a bird actually works. It’s very interesting. Have you done any research in the field of bioelectronics and this merging of biological and digital? I wouldn’t say research. I looked a lot into dendrochronology, the science of reading data out of tree rings. Then I went further and tried to see plants or trees as part of manifested algorithms. DNA is like a program that’s run and depending on which environment it’s running it will develop differently. I tried to see this in stone formations in marble but there is no algorithm because it’s not alive but it can still be an archive for data. I guess nowadays, everything can be data or can be an archive or a database. I think we have this affinity towards seeing concepts as binary. There’s always this thing and then there’s its opposite and this is the very prevalent view; culture and nature or technology and nature. I try not to see it that way because just culture and technology is just a very far developed result of nature, actually… what we call nature, which would be life in general. Everything we do has to be a result of nature, I guess. For some philosophical thought processes, you need to make this division between culture and nature. Sometimes, it’s very interesting to just see it as one is the result of the other and it’s just an ongoing process. The Ars Electronica is going very strongly in that direction. They have had a category for bio-art which is really interesting because this is something you do not come across in contemporary art. Is there a reason you picked those particular sounds? I felt that it would make sense to use the piano because, first of all, a piano is something you are very used to and it has a very long tradition. The piano itself always sounds the same for hundreds of years, probably now it’s been the way it’s played that’s always different. Second of all, the piano has a certain range of tones and there are no tones in between. In a regular piano, there are 88 keys, so this helped me make it a little more pleasant. Since there is no actual representation for the sound of wood, I guess, because there is no real sound of wood, I would say. I thought, I could practically use anything. It doesn’t need to be some abstract sine wave or modulation of something. And I looked into piano samples and it sounded good. It’s an instrument that you’re really used to, being socialized in a Western country. It made sense somehow. Did you do anything with other sounds besides piano? Would you be interested in doing an audio-only piece like an album? Actually, I’m doing that right now because, first of all, I was approached by a London label that wants to do a small release of different trees just out of this piano machine, which is something I was planning to do anyway, just for myself. I did not want to make a very long video with all of the woods but I thought to really hear the difference, it would be nice. And then again, I’m working on something more abstract that’s a feedback experiment where there is one sound going in through all of these effects and there’s a very long stream generated. There was this mathematical experiment where they say every breath you take includes one molecule of the last breath of Mozart or Caesar. It’s been re-calculated and they say it’s a 98.2% chance that this actually happens. Inspired by this thought is that you just have one sound to generate this feedback loop and it generates this sound-stream that evolves and informs itself. But it’s not actually the sound. I mean, you can’t actually hear the sound you sent in anymore because the effects are taking over and they shape the sound. Then you don’t really know anymore. Is it a product of just manipulating the effects? But the effect itself cannot produce a sound without an input. So I was interested in that, so that might be something I do next. So, there’s this loss of understanding between the source and what is being produced. It was with the Years piece because the sound is coming from the wood but it’s also coming from me somehow. It would be interesting to blur these boundaries. Like with this piece again with the birds on the strings, I’m really interested in just building setups and rule sets that I can apply to something and then I’m not really involved in the actual composition or the making of the piece itself anymore. This is something that I find very interesting. I really like to more design processes and apply them to something. It’s not just random, it’s this interplay with this rule set. Thanks so much for taking the time to speak with us. Hans-Joachim Roedelius’s work has been a huge influence on us here at Data Garden. We came across Cluster as we were trying to find an electronic language of our own and were surprised to hear so many commonalities with these new 35 year old sounds. Data Garden caught up with our favorite electronic pastoralist on his way to Moogfest where he performed 10/29/2011. The Self Portrait is very simple and meditative. What sort of concept were you thinking of when you started writing those records? There was no concept. I was just doing it because there was not much possibility. There was no machinery to do really good technical work. At the time, you were also working with Cluster. Was that a big change in terms of possibilities – bringing your personal work into a group setting? I was always interested to find my own tone language. Not only with Cluster. I started with others. I didn’t work as a soloist in the beginning. I worked with many people in Berlin at the time at the Zodiac. There were 8 people and there’s a record here available. The first ever recorded material from 1968 when we were people just trying to find out what’s going on, what we could do and which way we could do a relevant kind of tone art. So this was the beginning. And then when I got to be with Conrad Schnitzler as Kluster with a K and afterwards as Cluster with a C, every free minute, I tried to do my own music. Have you always been a full time self-employed musician or have you had other jobs? No, I am a masseur as a profession. I always had to do it to survive in the beginning of my career. Afterwards, I tried to survive with Cluster in a very rural part of Germany and I tried to be a gardener and work in the woods and bring wood for the stove in the wintertime. And to find food in the forest and mushrooms, and make my own bread and try to be a farmer somehow to get to the roots. Sowiesosso is one of our favorite albums. Between the cover and the sounds, there’s definitely a natural feeling to it. Can you talk a little about where you think that may come from or what your environment was at that time? I was very very happy at that time. I had a wife. I had a child. I could do gardening. I had to do a lot of hand work and I think that was very good for me because I came from a very big city and from traveling because with Kluster we were on the road for 2 years across Europe. It was a very unstable life, unsafe, unsecure with no money – just trying to survive doing art. Then I settled down and got to know my wife and family and I could work for my own living. I was so happy and I think it is all mirroring in the music. Have things changed a lot over the years? No. We have 3 children and 2 grandsons. I am still doing a lot of housework. My wife is a teacher and she is earning the regular money. 3 years ago it started that I could earn a living because of music. It needed that long that people could understand what I am doing. Like you. You know what’s in the music. At the time, nobody knew. We had to learn how to do it and people had to learn what it is we are doing. It’s weird and understandable. Now people understand it and I can make a living from it. I like to tour as well. This tour, I’m supported by my guys who are with me. Chandra Shukla and Jason Scott Furr organized the tour between ATP and Moogfest. Normally I would fly just for ATP and then come back. They arranged it and they are supporting. Chandra is driving and they have a new label. They’re releasing on Erototox Recordings. So do you have any new solo work coming out on the new label? New solo work just came out on a label in Vienna. It’s called Ex Animo. There’s a collaborative record that just came out recently with a guy from Map Station. Then there is the new Qluster with a Q. Are you just going to keep making records in the hundreds? It just happens. It’s not by purpose. It just happens accidentally. On that note of things just happening. When do you find the theme? How do you name an album? It’s the second process of creativity if you’re doing music like I’m doing it. I don’t know what I’m doing. I have to listen to it and then I have to try to find something equal to the music. It’s the second creative process. Music came out of living and it happened like that because I have no academic education. I had to do it like this. Normally people go from the beginning learning an instrument and rehearsing every day and playing the instrument well. It’s a different approach to music if you really have to learn what is this sound, what is it doing? How does it work? How do people react to it? It’s a long process if you do it like this and I think it’s a good way to make your own music. And it’s really your own because you had to feel what the sound is and what the tone is to be able to work with it in a relevant way. Who was your main inspiration to start playing improvised music? Any earlier pioneers? I listened to Xenakis and Pierre Henry and to the old avant garde in France but I never listened to Stockhausen because that was not my thing. I didn’t like it in fact. I never liked very much Kraftwerk. I wanted to do my own thing. I wanted to become able to create my own tone language and I did. I think it worked out well. People know now when they listen to Roedeleus music, it’s Roedelius music. It’s incomparable in a way. How do you feel that people in our generation think of you as a pioneer in electronic music? It was not my aim. I just wanted to do myself what I like to do. I was a physical therapist for 10 years and was meant to be working in a hospital or a wellness center or something like that. It was not my aim but it worked out like this and I’m very happy about it. You see because people are coming and listening. Data Garden interviews bio-art pioneer Richard Lowenberg. The artist has exhibited internationally since the late ’60s- trailblazing the fields of bio-sensing, video-media-performance arts, tele-community development, information ecology and bio-regional activism & planning. 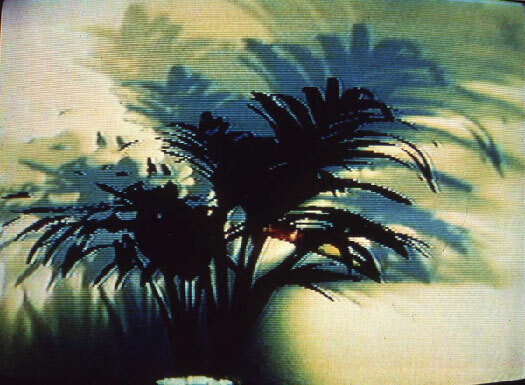 Brainwave and plant music from The Secret Life of Plants, 1976. Thanks for joining us for our first interview! Can you brief us on the origins of your bio-communication art? In 1970, I began actively working with new portable video systems, and with Woody and Steina Vasulka (Kitchen founders, 1971), explored the interface between various analogue audio and video synthesis systems; not to make programs, but rather to play in the realms of electronic signals, feedback and noise. I also met Peter Crown, Ph.D., physiological psychiatrist, and together we built simple EEG biofeedback systems, which we used as interface with audio/video synthesizers, and we had weekly evening presentations at the Kitchen. Our tools and abilities were limited. Jim Wiseman working with Paik/Abe and Sandin Video Processors. In the mid-70’s I settled in the San Francisco Bay Area, in large part to attempt collaborative art-science work with NASA Ames Research Center. A number of creative projects resulted from the ‘informal’ collaboration among artists and scientists/technologists through 1981, beginning with use of multi-channel bio-telemetry devices and remote sensing systems with dancers (EMG muscle monitoring); wind-tunnel and multi-spectral imaging (thermography, holographic interferometry and schlierren) experiments; CTS satellite communication/performance projects; and gravitational simulation and performance experiments (Gravitational-Field-Day), which were funded in part by the NEA, and came to an abrupt end shortly after the presidential election of Ronald Reagan. John Lifton prepares a plant for live performance. In early 1976 the producer and director of an about to be made feature film, based on the book, The Secret Life of Plants, brought John Lifton to San Francisco to work with me on sequences we designed for the film. I also brought in Tom Zahuranec and Jim Wiseman for this project, which shot sequences at the Plant Conservatory in Golden Gate Park and at the World Stage soundstage in Hollywood. John, who I had previously met in London and worked with in Telluride, CO through the mid-90s, is an architect/planner and composer who built early digital audio processing systems, and had premiered Green Music (plant sensing) in London in 1975. Tom worked at Mills College and was interfacing plants and other bio-signals with a Tcherepnin audio synthesizer that he helped to build. 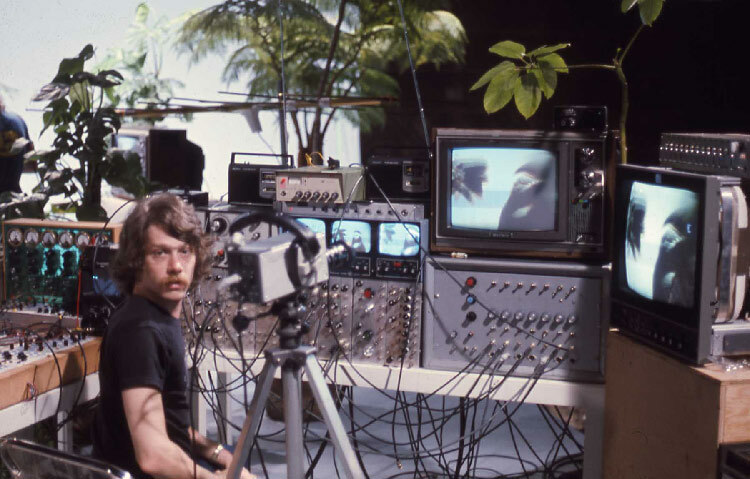 Jim was a video artist/videographer who built his Paik-Abe synthesizerwhile at CalArts and his Sandin Image Processor while at the Chicago Art Institute. I provided the multi-channel bio-telemetry (wireless FM transmitting) systems which we monitored up to six dancers’ brain waves and muscle electrical potential signals, as voltage-control inputs to the audio and video systems, in compositional sync with John Lifton’s multi-channel audio output generated by gold needle electrode sensing of plant physiology. The film ultimately used little of our recorded performances, was not widely released (production conflicts) and is difficult to find copies of. Plants were only one of many living organisms that we worked with, along with environmental monitoring/sensing/transducing, as basis for creative media-performance works: Bio-Dis-Plays. Tom Zahuranec routes amplified plant energy into handmade Tcherepnin synthesizers. What were the some of the difficulties of interfacing living systems with video synthesizers and early digital computers? The works alluded to above, were being done during the period of transition from analogue to digital technologies. They were designed, yet trial and error efforts. Many informal experiments, as well as public performances were conducted over many years. Each time, allowed us to involve other collaborators (David Rosenboom, Paul Demarinis, Virginia Quesada, Henry Dakin, Kit Galloway and Sherrie Rabinowitz, Keija Kimura, Margaret Fisher, Judith Azur and more), new technologies and processes. More than ever, bio and eco-systems sensing and processing continues to be an area of rich creative exploration, tool-building and performance/installation by many others, currently. Video feedback produced by Jim Wiseman. There was a popular horticultural interest in the 1970s, as well as the study of ‘plant consciousness’. Have you found any evidence of this in your work? Plants are sensitive, in-tune, living beings. We still barely understand their physiology (such as photo-synthetic conversion of light into energy). I have always been careful not to project inferences on the meaning of the simple signals which we were sensing and processing. They are part of our complex, inter-dynamic, co-evolutionary environment, which we simply wanted to tune into and present publicly, without explanation. In your 2005 proposition for a slow-tech movement, you’ve stated "...technological progress is rapidly outpacing and out of sync with social progress and development.” Do you feel that today’s art benefits from or is hindered by technological advances? Technology takes many forms, being an evolutionary by-product of our human relationship to our surrounding environment and circumstances, physically, socially, conceptually. Current technological development is largely fostered by our political-economic systems, which in part, promote ‘consumerism’ and large scale ignorance of ecological processes; resource extraction, to materials processing, to waste production. The arts have also been largely complicit in a myopic understanding and involvement in the use of technologies, with primary interest in so-called media technologies (not energy, medical, military or transportation technologies). Artists, given their self-endowed freedom of expression and livelihood, have also led the way technologically, and scientifically, from the beginnings of human development (from writing, and printing, to photography and sound recording, to inner and outer space exploration. For the last many years, a key area of my creative work has been focused on ‘economics’; what and how we value tangibles and intangibles, as the framework for social cohesion and development. In that context, my interests and works address the nature of ‘information’, within a better whole systems understanding of ecological economics; care of our household. Finally, I have learned that all of my works in the realms of the senses, have primarily been about people, about how to respect and work together, about how to collaborate beyond short term project goals, and about how creative intention, attitude and example can inspire people to needed transcendence. How has your early work influenced your current work as a large-scale information architect and community planner? As stated in the beginning, the early biofeedback experiments were part of an ongoing exploration and creation of works which look at portions of our electromagnetic information environment. As an artist, my central interest is in how we (all things) sense and communicate. In playing with NASA (plus Stanford Medical Center, SRI, Xerox PARC, Washington Research Center, etc. ), I also became familiar with the ARPANet, satellite communications, the Home Brew Club and Community Memory, which laid a foundation for what by the late ‘80s had evolved to be termed ‘community networking’ initiatives. Telluride, which John Lifton and I were involved in the regional master planning of from the late ‘70s through the mid-‘90s, became a pioneering test-bed for ‘community networking’, as our InfoZone project made Telluride the first rural Internet POP and first wireless WAN in this country in the early ‘90s. Since then, I have had the opportunity to direct a community networking project based in Davis, CA, and by invitation have had involvements in local-global Internetworking efforts throughout the US, as well as in Japan, Europe and Latin America. In 2006 I settled in Santa Fe, founded the 1st-Mile Institute, joined planning firm, Design Nine Inc. (led by Andrew Cohill, Ph.D., and contracting inter-nationally), and have been contracted to lead New Mexico next many years of broadband networking and networked society-building, for the State. Our evolving ‘information society’ and ‘information revolutions’ continue to be about how we sense and communicate. Our tools are simply ‘sensory aids’. My early path continues to be on-course through the still poorly understood ‘information environment’. Listen to an album of plant-controlled music designed by Data Garden artist, Joe Patitucci.